I downloaded the Kindle version of this book (cover shown at left). 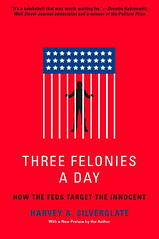 THREE FELONIES A DAY: How The Feds Target The Innocent by Harvey Silverglate is recommended reading for anyone who holds liberty true. You can click on the image for more details. From a major listserv, I learned Three Felonies a Day is the story of how citizens from all walks of life--doctors, accountants, businessmen, political activists, and others--have found themselves the targets of federal prosecutions, despite sensibly believing that they did nothing wrong, broke no laws, and harmed not a single person. From the perspective of both a legal practitioner who has represented the wrongfully-accused, and of a legal observer who has written about these trends for the past four decades, Three Felonies a Day brings home how individual liberty is threatened by zealous crusades from the Department of Justice. Even the most intelligent and informed citizen (including lawyers and judges, for that matter) cannot predict with any reasonable assurance whether a wide range of seemingly ordinary activities might be regarded by federal prosecutors as felonies. Get details on the book from http://openlibrary.org/works/OL5827943W/Three_felonies_a_day, from Amazon ISBN 9781594032554, from OCLC, from Library Thing or from Goodreads. [liberationtech] Why didn't tech company leaders blow the whistle? You. Yes, YOU Are a Criminal!